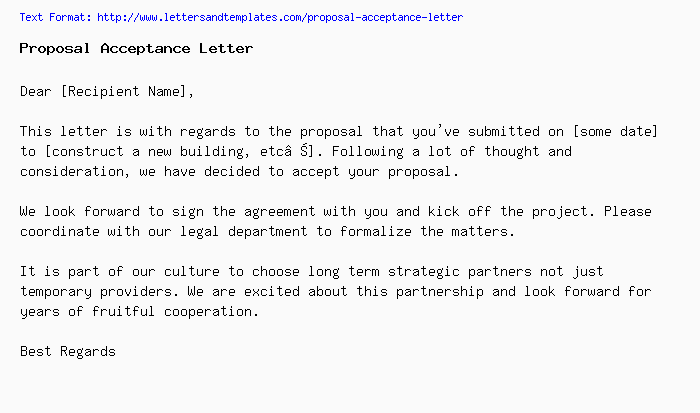 This letter is with regards to the proposal that you've submitted on [some date] to [construct a new building, etc…]. Following a lot of thought and consideration, we have decided to accept your proposal. We look forward to sign the agreement with you and kick off the project. Please coordinate with our legal department to formalize the matters. It is part of our culture to choose long term strategic partners not just temporary providers. We are excited about this partnership and look forward for years of fruitful cooperation.